Ben Benjamin, psi-tech Navigator, and Cara Carlinni, Telepath, can never go home again. To the Trust and Alphacorp alike, they are wanted criminals. Murder, terrorism, armed insurrection, hijacking, grand theft, and kidnapping are just the top of a long list of charges they’ll face if they’re caught. So they better not get caught. These are the people who defied the meBen Benjamin, psi-tech Navigator, and Cara Carlinni, Telepath, can never go home again. To the Trust and Alphacorp alike, they are wanted criminals. Murder, terrorism, armed insurrection, hijacking, grand theft, and kidnapping are just the top of a long list of charges they’ll face if they’re caught. So they better not get caught. These are the people who defied the megacorporations and saved a colony by selling the platinum mining rights and relocating ten thousand colonists somewhere safe, and they’re not saying where that is. They take refuge on crimelord-run Crossways Station with the remnants of their team of renegade psi-techs and the Solar Wind, their state-of-the-art jump-drive ship. They’ve made a promise to find a missing space ark with thirty thousand settlers aboard. But to do that, Ben and Cara have to confront old enemies. Alphacorp and the Trust: separately they are dangerous, united they are unstoppable. They want to silence Ben and Cara more than they want to upstage each other. 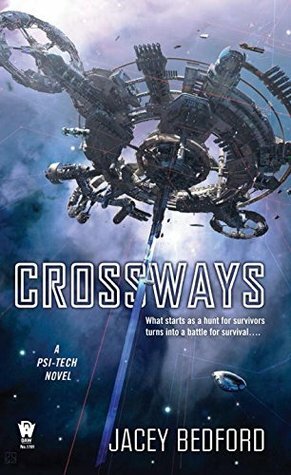 If they have to get rid of Crossways in order to do it, they can live with that. In fact, this might be the excuse they’ve been looking for…. This is a really good continuation of the series. We continue to follow Ben & Cara, and it's a cool world. I'm really loving some of the characters, there's a great bit of action, and there is good world building (and a cool consistent space society).This is a great series to escape in, highly recommended. Good follow-up novel. A little more predictable than the first book, but still good. Ending makes it obvious there will be a third novel. Not as good as the first book, but enjoyed getting to know characters more. Enjoyed the plot, though others thought it dragged on. Another good space romp to follow on from "Empire of Dust". The kid rather annoyed me - typical brat type who turns hero - I think eleven year old heroes should remain in Young Adult novels. I do like Fantasy rather more than SF, but I don't like it when the genres get too mixed together and some of this "fold space" stuff and s pretty close to magic. Of course, a big lampshade was hung on psi in the first place, so perhaps I shouldn't complain. An enjoyable read. What a bunch of arrogant heroes. I need some antiheroes as a contrast for my next read, all this righteousness and superskills and flawlessness and uberluck made me a bit nauseous. I hope the author will learn to bring real characters and probabilities into their plots for the next books, as the story itself was quite entertaining. An enjoyable follow up. It felt rushed at times and that it might have been better as two separate books. I found it an addicting and enjoyable read, but certainly not a masterpiece. Again a warning about brief sexual scenes. Even better than the first book, with plot twists and hair-raising adventures aplenty. Looking forward to the next one. This is a perfect SF novel! Loved it! Well written with great characters and a plot that kept you interested through all 536 pages.